I was looking through my pictures to clean it out (since I got so much junk...>_<)..
And I found this picture of a Chibified Hunter character from (one of the most popular) online game, Ragnarok Online! It's just a really simple (and plain) wallpaper. I really didn't have any idea what to do with it and I decided to leave it like that. 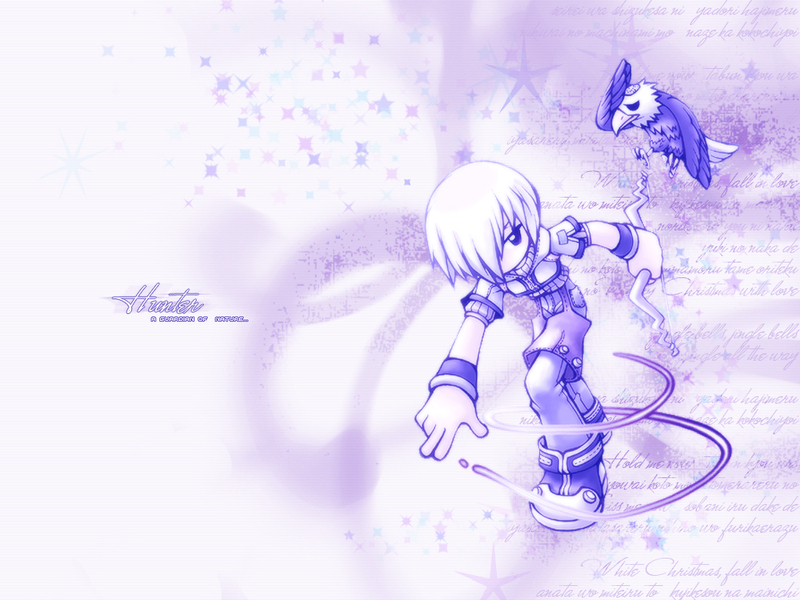 Nice RO wallpaper. Definately better than anything I can do. The violet and blue are really nice colors for the Hunter. I like much your colors, the text.... and the character is really well!! And yes, I like the simplicity. The brushwork is also nice. Overall really nice wall, everything just seem to click to one another awesome work. nice colour, like the simplicity of the colour. it adds a nice touch to the pic. Cute wallie you got there. I love the colors and the pic is very cute. :) Nice job and adding to favs! good good piola piola esta buenooooooooo!